This article first appeared November 2, 1957, in the publication Mayovox. A training program for cytotechnicians will begin this month in the Cytology Laboratories of the Section of Surgical Pathology at St. Marys and at the Clinic. The program is planned to meet an expected increased demand for cytotechnicians as the result of plans of the Minnesota Division of the American Cancer Society for a publicity campaign to demonstrate to general practitioners and their women patients the value of examination of cervical smears in the detection of uterine cancer. In a letter to members of the Minnesota Society of Clinical Pathologists, Dr. David C. Dahlin, a member of the group’s Cytology Committee, points out the need for pathologists to expand their facilities to handle an increased number of smears and a consequent need to train more technicians. The American Cancer Society, through its state divisions, will provide $200 a month to the technician-trainee and $100 to the institution for a training period of four months. Trainees who can fulfill educational requirements, on completion of their training in cytology can qualify for registration by the Board of Registry of Technologists of the A.S.C.P. However, the Cancer Society will subsidize the training of any technician who is recommended by a pathologist. The Clinic can accept four technicians at a time for training, reports Dr. Dahlin. Recent remodeling in the Surgical Pathology Laboratories at St. Marys has provided enlarged quarters for the Cytology Laboratory (see photo above) and initiation of the training program was delayed until its completion. Dr. Dahlin is chairman of the Clinic’s Cytology Training Committee whose other members are Dr. L. B. Woolner and U. W. Tervo. 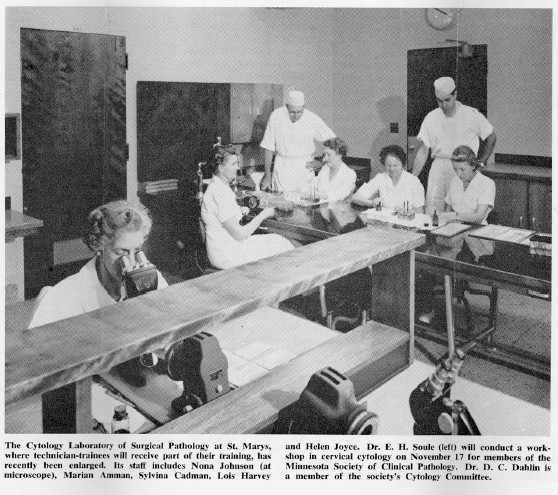 Technician-trainees will work under the supervision of the laboratory staff in an “on-the-job” training program and will rotate between the St. Marys and the Clinic Cytology Laboratories.